I did a bit of research and checked out a couple online communities specifically geared to wet-shaving, and asked in the forums what people would want in their ideal shaving case. 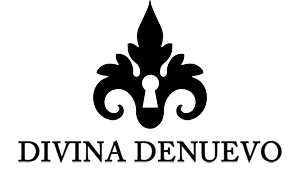 What came from that research was a very clear division – people either wanted a ‘dopp kit’ style toiletry bag (like the one we make) where they could throw everything in and go, or a ‘military wet pack’ style, the kind that has dedicated slots for everything and rolls up. 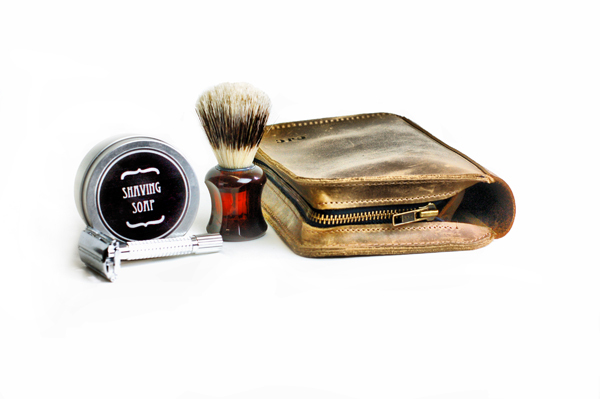 I spoke with his girlfriend and she felt that he would be more likely to go for the dopp style, so it was just a matter of figuring out how to protect his safety razor and shaving brush from everything else in the case. 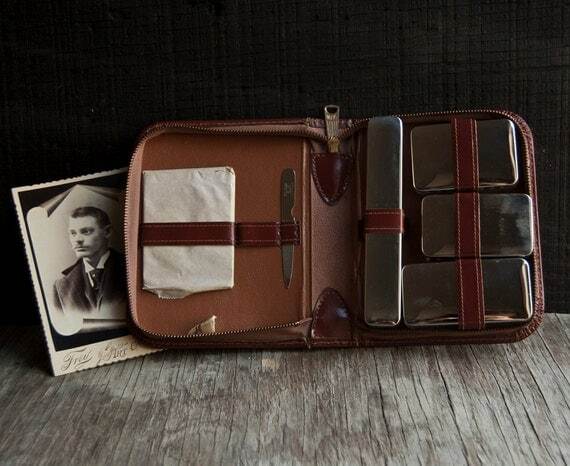 I looked at the vintage shaving cases from back when safety razors were the norm, and found that it was quite popular to have little kits with slots for the razor, brush and shaving soap. 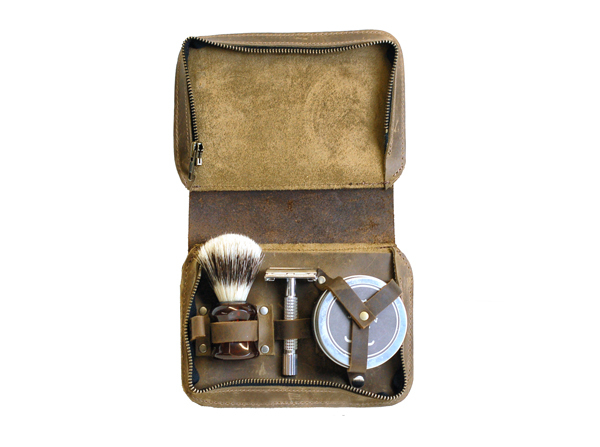 So I asked his girlfriend for the dimensions of his razor, brush and soap – and set about designing a case that fit his specific set up. I made the case out of our Tan Brown oil tanned leather, using Chocolate Brown for the accents, so that it would match the larger case that has the same colour palette. 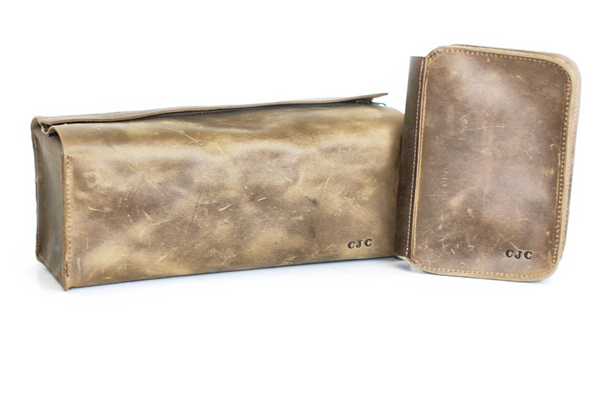 The oil tanned leather lends itself perfectly to a toiletry set, since it will not only distress beautifully, but also protect everything with its waxy coat. I found a metal tin that was just the right size to keep his shaving soap, and designed a vintage style label for it (secret geek fact: I peeked at his website to see what type of typeface he chose to get a better idea of what kind of font he would like that I could use for the label – sneaky, sneaky!). The tin is secured by a Y strap of leather with a snap – I love how it reminds me of an old ammo pack. The strap that holds the razor and brush in place is adjustable, so you can be sure that everything will always fit securely. 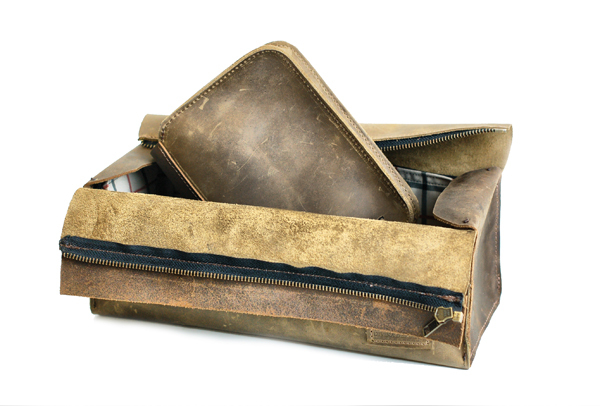 The case fits perfectly into our signature toiletry case, making it a complete solution for travelling: the big toiletry bag can carry things like shampoo, deodorant, toothbrush and toothpaste and all other men’s toiletries, and the new wet-shave case fits inside it and can be taken out specifically for a shave. Last but not least, to add an extra personal touch, I monogrammed both cases with his initials. There you have it – a perfect gift set for any man. After making this first one, we agreed to offer it on the website in time for the holidays. Keep an eye out for it!